Think you know what this post is about? Sorry, try again. Based on the title, you may think this is about saying “Thank You” in the workplace. It’s not. This post is not about supervisors expressing gratitude to employees to improve performance. It’s not about encouraging co-workers to say “Thank You” to one another. Nor is it about providing Total Compensation Statements to help employees count their many blessings in the workplace. It’s not even about striving for a culture of gratitude to obtain the elusive HR pot of gold: employee engagement. It’s about being grateful—not just at work, but in life. It’s about how gratefulness is a rich component of wellbeing. It’s about why employers should tout its benefits. Any internet search on gratitude will lead you to articles either written by, or quoting, the king of research on the topic: Professor Robert E. Emmons of the University of California, Davis. His statements are too commanding not to include. Emmons summarizes his research by writing, “Clinical trials indicate that the practice of gratitude can have dramatic and lasting positive effects in a person’s life. It can lower blood pressure, improve immune function, promote happiness and well-being, and spur acts of helpfulness, generosity, and cooperation.”[i] Hmmm. I’ll take two, please. Gratitude is an awareness of something good in our lives and that this good is, in some form, a gift. Gratitude includes an understanding that we have a positive experience resulting from something outside of our own control. Employers concerned about the wellbeing of their employees know that what happens outside office hours often has the highest impact on wellbeing. A stand-up desk at work is nice, but it’s value is diminished if the employee isn’t engaged in physical activity before and after work. Bringing a healthy salad to work for lunch is admirable, but it does little to counter the employee downing a quart of ice cream every night in bed while streaming movies on an iPad. Again, the goal is not to encourage gratefulness simply to raise employee morale. 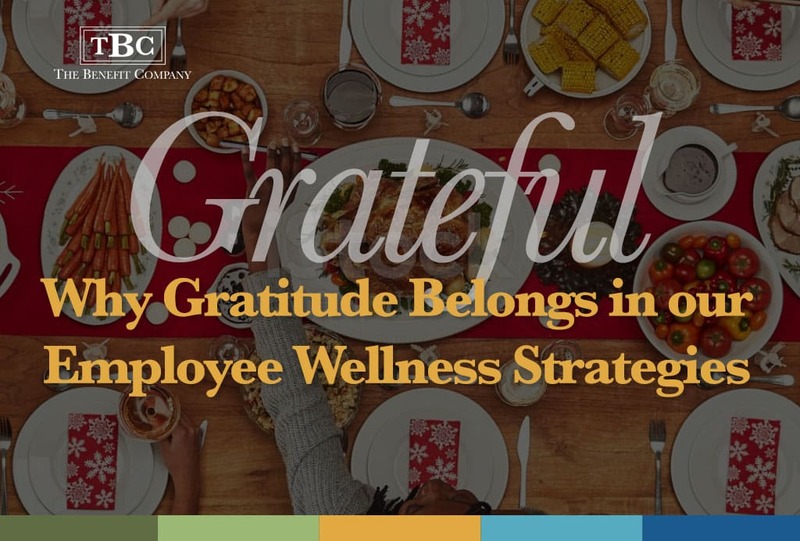 The goal is to purposefully include gratefulness in the employer’s employee wellness game plan to impact the overall wellbeing of employees. An Example from Mr. Brown. Carey Brown, the founder of The Benefit Company, has a very subtle way of stimulating gratitude with nearly every email he sends within our firm, and to our clients and partners. For the valediction in our emails, most of us will type something such as Sincerely, Kind regards, All the best, Have a good evening, or—my go-to—”Take Care.” But not Carey. Most often he ends his email with “Gratefully, Carey” a simple, humble, yet poignant expression of gratitude to the recipient. Anne Murray sang it; we put it into practice. Just two years ago we implemented a practice of starting team meetings with a segue designed to declare a little good news where each team member shares something positive. However, this is not a time to report on something good about our work. Rather, it is designed to encourage us to share good news from our personal lives. Starting a meeting with a round of good news does several things. One, it aids us in getting to know each other better. Secondly (speaking from personal experience), it forces each of us to stop and find at least one reason to be grateful. Finally, and perhaps most importantly, it compels us to start our meetings with a positive vibe. Using the previously mentioned quote from Robert Emmons, communicate the benefits of gratitude through company newsletters, email signatures, or company branded posters. As mentioned above, begin team meetings with a round of sharing good news. Train leadership in expressing gratitude, and to beware of malcontent and bellyaching. Use the month of November to emphasize how thankfulness leads to better overall health and wellbeing. Consider adding gratitude to your stated core values. If you have wellness coaches, ask them to incorporate fostering gratitude in their wellbeing offerings. About the author of this post: Jack W. Bruce, SPHR, SHRM-SCP, is the Vice President, Strategic Operations for The Benefit Company in Atlanta, Georgia.